TGIF! TGIF!! Do ya feel me?? It’s been one of those loooong, crazy weeks and I am so glad it’s Friday!! This weekend, like most, I have some fun things going on, including a fun ranch/horse riding outing with my Little tomorrow. We are both looking forward to that, and the weather is going to be absolutely amazing for it. I don’t think I’ve been on a horse since I was about 4 so…that should be interesting. Contrary to what many believe, most Texans do not ride horses every day. Or to school. But, if I were one of the cowboy types, living and working on the range, I’d sure like some of this venison chili. By the fire. Under starry, country sky. Just sayin’. I’ve been working on perfecting my beef chili recipe for a couple of years, but this recipe…doesn’t need any more perfecting. 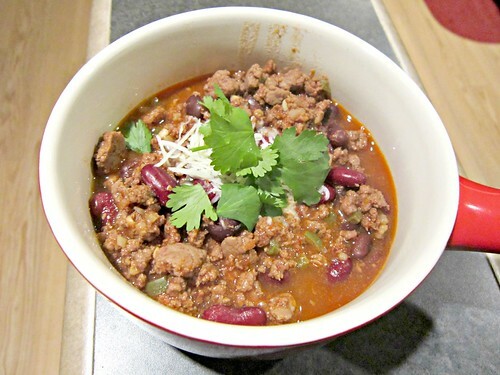 It has a great blend of seasonings, two kinds of beans, and the jalapenos really add a good flavor and kick of heat. Operation chili perfection: complete. And while the original recipe says to cook for 3 hours, I only cooked about an hour and a half. J was hungry, what can I say? And it was still perfectly delicious. So…cook longer if you have the time, but it’s not required to achieve a great flavor. I originally planned to make 1/2 a batch because it makes so much and I didn’t want any to go to waste, but we ate every last bite of it. It was good, yo. In a large dutch oven, heat olive oil over medium heat. Add the jalapenos and garlic and cook for about two minutes, until fragrant. And the venison, salt, chili powder, cumin, coriander, and oregano. Stir and cook until the meat is browned. 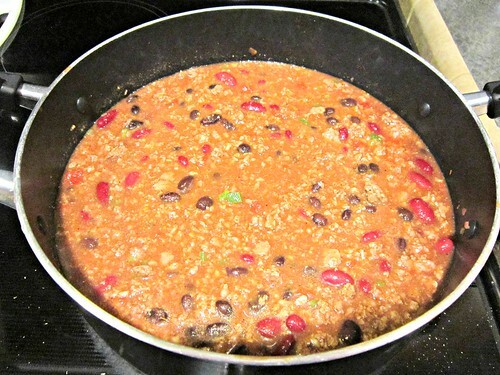 Add & stir in the crushed tomatoes, undrained cans of beans, and beef broth. Heat to a boil, then reduce heat and simmer, covered, for at least an hour, up to 3 hours. The longer you are able to cook it, the better it will taste. Serve with cheese, chopped green onions, and cilantro.